👋 Our new book on Unity is about to come out! We think it’s our best yet. If you’re interested in game development, please check it out? 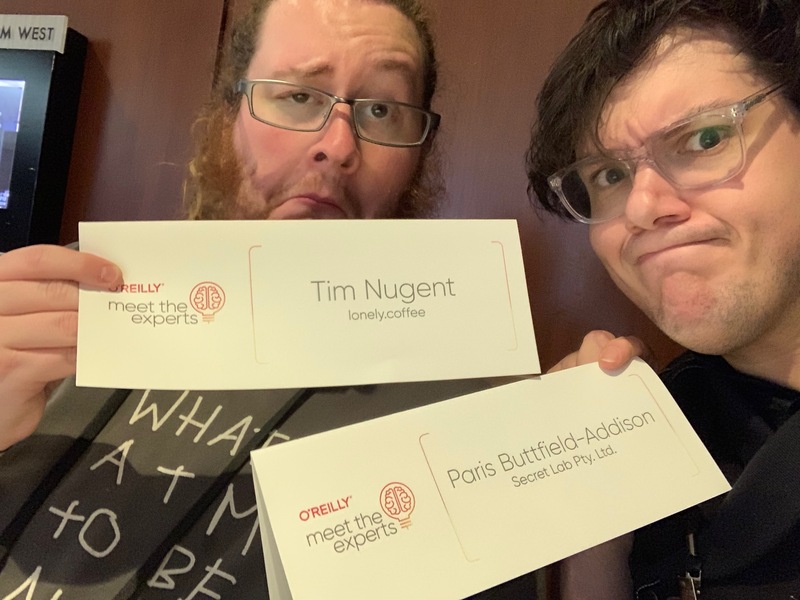 The O’Reilly Software Architecture Conference 2019 (SACon) just wrapped up in New York City, and I was privileged enough to attend as a speaker with my friend and colleague, Tim, and partner and colleague, Mars. 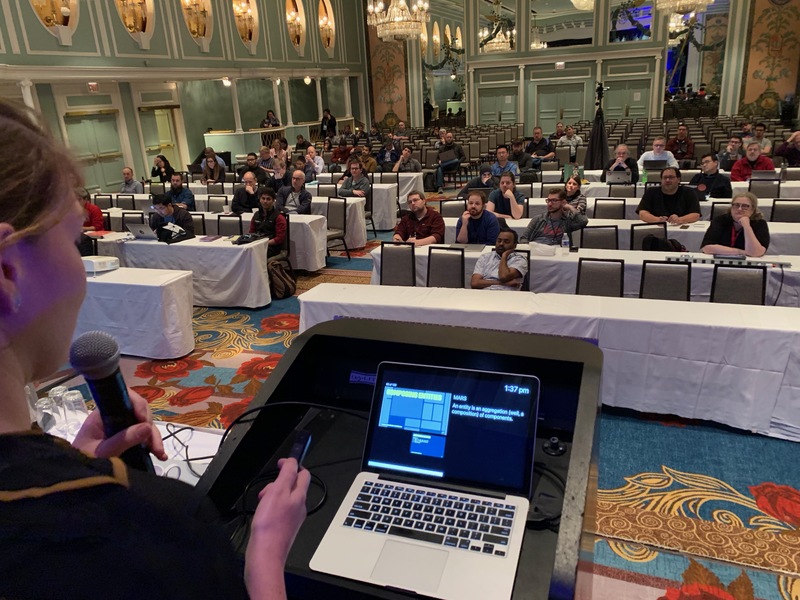 Together, we presented a session called Entity-Component-Systems and you: they’re not just for games anymore, and Tim and I did a book signing for our recent title Learning Swift (3rd edition), as well as a Meet the Experts session. I was initially quite sceptical of the SACon, because the idea of an event based on ‘software architecture’ conjured up images of very dry sessions on traditional, serious enterprise architecture, presented by uninspired, uninspiring people. As it turns out software architects, and those who attend software architecture conferences, are incredibly passionate, interesting people, who are the very opposite of the straight-laced faceless people I imagined. SACon was a melting-pot of interesting ideas, framed around the discussion of software architecture as a profession. O’Reilly’s conferences are always polished, well, run and all that good stuff (disclaimer: as might be obvious, O’Reilly is my publisher), but the attendees and speakers are what makes any conference shine. This conference definitely shone. The ‘hallway track’ was also exceptional, and we had some fantastic conversations with attendees on topics ranging from the rise of the Rust programming language to the use of ECS in non-video games to the merits of the Swift programming language to designing video game engines, and beyond. Tim and I really enjoyed our book signing, and found ourselves face-to-face with one of the biggest queues we’ve ever had for a book signing, and had some excellent conversations with developers, architects, and team leads who were excited to learn Swift from our book, or share it with their teams back home. 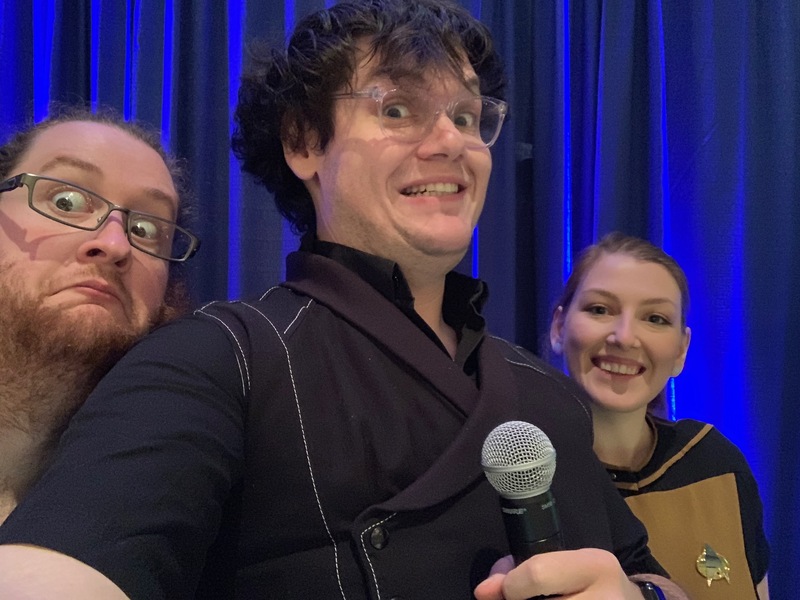 Our ECS talk went well! We had a packed room (which was also one of the most palatial conference halls we’ve ever spoken in!) and got 5-star reviews with great feedback. If you’re interested, you’ll find the slides from our talk on ECS are available via the conference website. We’ll also post a link to the video once it becomes available. There’s some follow-up resource we want to share with attendees of our talk. We hope you find them useful! I’m excited to return to a future SACon! The good news is there’s lots of them to choose from! San Jose is coming, as is Berlin! Our new book is (almost) out! You can read it on Safari, or buy it on Amazon, or at your favourite bookseller! These videos are designed to accompany and support our upcoming book, Mobile Game Development with Unity (also on Amazon and Safari). If there’s no purchase available yet, there will be soon! Everything is available on Safari right now, though. This year, Jon gave a talk at GDC called “Making Night in the Woods Better with Open Source”. In it, he talked about how Night in the Woods (which came out last month and you should totally go buy) used the open source process in its development. Unlike most of our other talks, we did something a little ridiculous with this one – we built an entire presentation system, from scratch, into Night in the Woods. We’re actually pretty proud of this, and so we put together a video showing how it was done. Check it out!